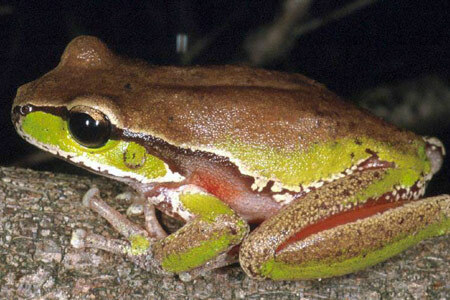 Found in the coast of New South Wales to the Blue Mountains, the Blue Mountains Tree Frog is a beautifully coloured frog with a base colour of medium brown it has a dark line from its nose to its groin with a lighter line above it. The Blue Mountains Tree Frog has bright green spots on their head and limbs as well as orange and red marks on their arms and legs making them quite a sight to see. The Blue Mountains Tree Frog is a wonderful jumper and even a great swimmer although they do not have webbed feet like other frogs.